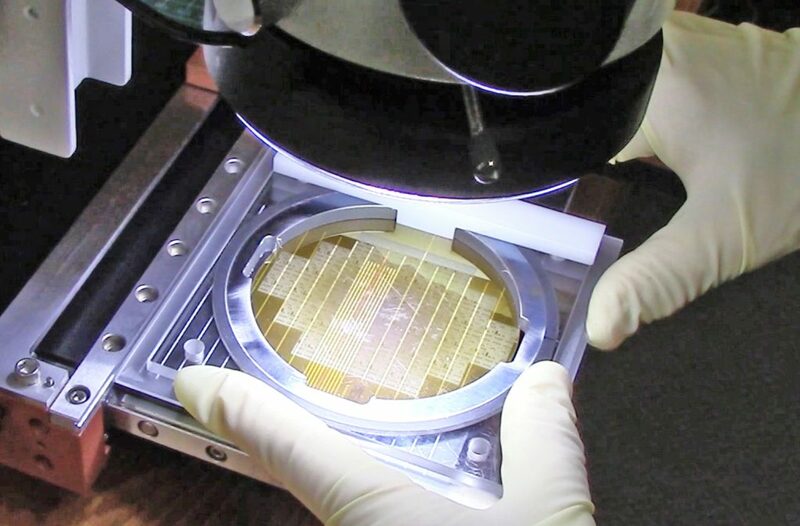 As cleaving is fast, low cost with no loss of material, several 3" sapphire wafers were acquired to revisit cleaving of sapphire using two recently developed methods. 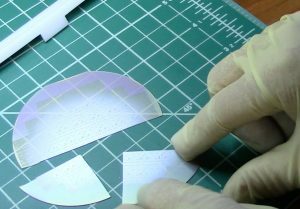 These methods are differentiated from handheld scribing and cleaving because they integrate diamond indenting, scribing and cleaving into a mechanical platform. The "smart" mechanics (knobs, levers, dials) enable a repeatable process and remove variation in results based on the operator. It also allows for new test conditions that are not possible with handheld processes. Figure 1. Weak points made by scribers, the FlipScribe and LatticeAx. The second step in preparing a cleaved sample is cleaving. Cleaving occurs by creating stress on the weak point. The cleave is then initiated and propagates across the sample. If the sample is crystalline, the best weak point is short (Figure 2) as it initiates a cleave following a crystal plane. 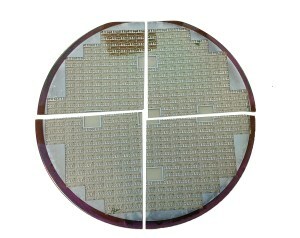 The resulting cross section will have a mirror finish (Figure 3). If the sample is amorphous, the sample will break but without a crystal plane, the cleave will propagate in the direction of the weak point but may not be straight unless a long scribe is made scribed across the entire desired line of cleavage (Figure 2). The resulting cross section will not have a mirror finish. This "long scribe" approach is also used on crystalline material when the line of cleavage needs to be counter to the crystal plane. 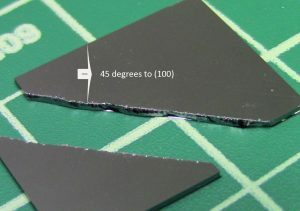 Figure 4 shows a silicon sample cleaved at 45 degrees to the (100) crystal plane. Note that because the cleave is counter to the crystal plane the edge is rough. 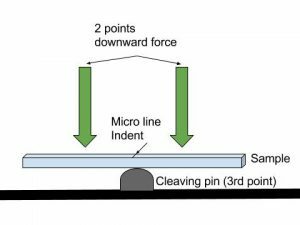 Cleaving can be done by splitting the sample in two with fingers, pins, pliers, or indenting and cleaving tool such as the LatticeAx. The two tools used in this study for creating the weak point and cleaving are the LatticeAx® and the FlipScribe® . 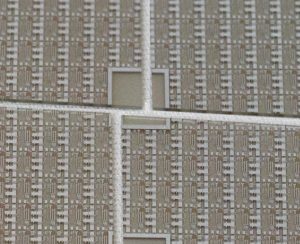 A 3" sapphire wafer was cleanly cleaved using the LatticeAx's standard, highly repeatable and accurate microline indent and cleave process. 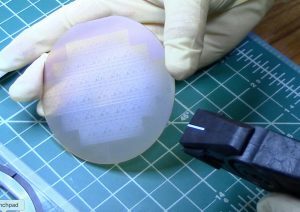 The LatticeAx's microline indent was used to make the short indent at the edge of the wafer. This weak point then propagated along the crystal plane using the LatticeAx's 3pt cleaving method. It resulted in very clean cross-section faces such as those required for photonics applications (Figure 6 and 7). Method 2. 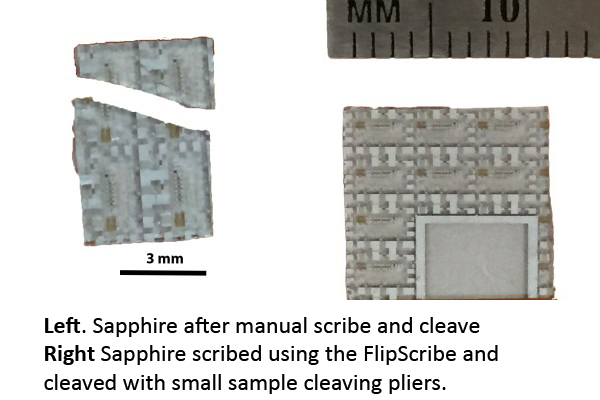 Use of the FlipScribe® to scribe, cleave and downsize a 3" sapphire wafer. 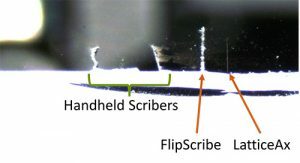 Note that for applications that require the wafer to be diced along the scribe line of the electronic structures the FlipScribe, scribing machine, is used to counter the cleave along the a-crystal planes of sapphire. 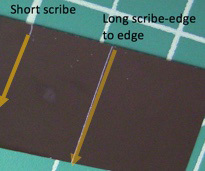 Scribing will "force" the sample to break along the die scribe lines which are typically orthogonal. In Figure 10, the left image shows a sample cleaved after manually scribing with a pen style diamond scriber, note that the sample cleaves along a crystal plane which is not parallel to the lithography. To its right is a sample cleaved using the FlipScribe. This preparation resulted in a sample (10 mm on a side). 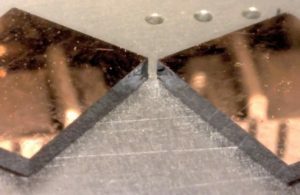 This is typically desired for cross-sections and when testing the performance of a die. A weak point (long scribe line in this case) made with hand scriber is commonly too deep, large and destructive. If it is "too weak" the cleave naturally propagates through the strong, natural crystal plane. The cleave will always follow "the path of least resistance". 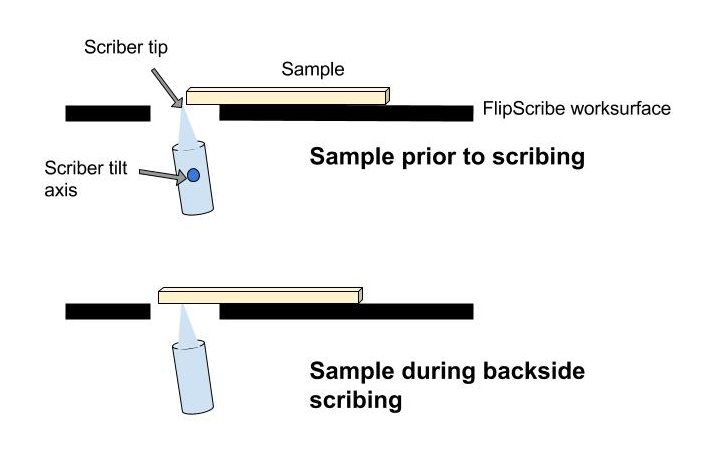 The FlipScribe scriber height and tilt can be optimized for the material and subsequently preset for a repeatable process. 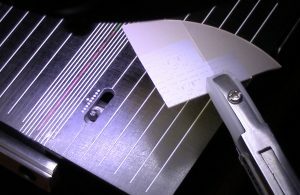 The holder secures (Figure 8) the sample assuring a shallow, thin and straight scribe line creating a "strong weak point" to initiate the cleave. 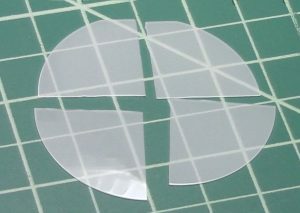 The 3" wafer, 470 µm thick, shown in Figure 8 was scribed and cleaved using the FlipScribe and a combination of the Cleanbreak Pliers and Small Sample Cleaving Pliers. In this case, a short scribe was made perpendicular to the flat as in this direction the crystal plane was parallel to the lithography. Parallel to the flat, long scribes were made to force the cleave to follow the lithography, not the sapphire crystal plane. Scribing was performed on the FlipScribe using a custom designed 3" wafer holder. 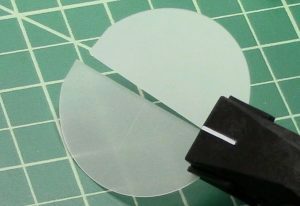 After scribing, the wafer was cleaved using the Cleanbreak Pliers as shown in Figure 11. Figure 12 shows the wafer after cleaving both parallel and perpendicular to the flat. 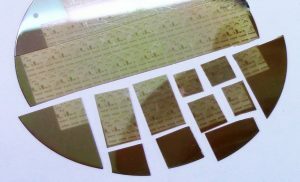 To cleave the sapphire wafer into smaller samples, a small piece holder was used to grip the sample and make clean, straight scribes. Small die sized samples were cleaved using pliers optimized for small samples (Figure 13).